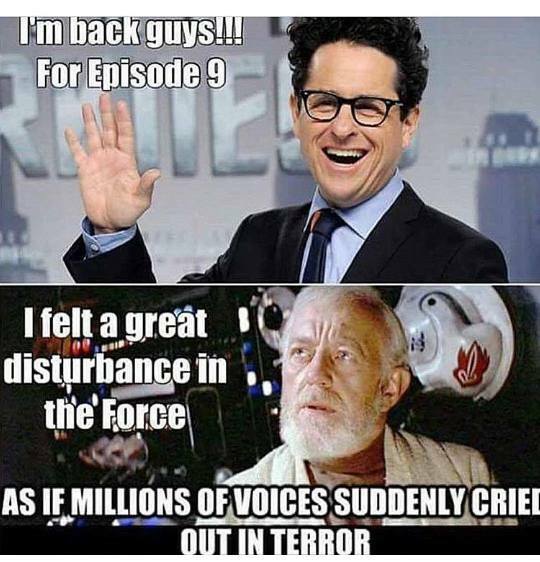 JJ Abrams?!?! THAT IS SO....boring. It's a safe decision, Disney is clearly being very cautious. I'd rather a more interesting choice, like Guillermo DelToro. I would have picked Christopher Nolan myself but JJ Abrams will do just nicely. At this point, it probably doesn't matter who they go with, as long as they have a minimum amount of skill. I doubt any artistic vision will make from the director into the finished product. It's too bad. One of the reasons I was excited about the spinoffs was the chance to see this world through someone else's eyes. I agree. It's also too bad because when Episode IX is released we'll have 11 Star Wars movies total, and allowing some artistic vision would prevent the franchise from becoming stale. He's also writing it. AKA, 15 death stars and the plot of ROTJ, here we come. I was just think that as well! Sigh... some of you, always assuming the worst. Release date pushed back 7 months now.. I was always expecting a December 2019 release date anyways. I wouldn't defend JJ to the bitter, bitter end unless I honestly believed in the deepest part of my soul that he could deliver something that is at the very least... good. Yeah, I think it will be good, but probably not groundbreaking. Exactly. Which in this series, after 9 films of a lot of repetition, going out with something great is important.